Happy St. Patrick’s Day! Today St. Patrick’s Day is celebrated across Northern Ireland, and this well known, beloved celebration of Irish culture and history may have you thinking about visiting Ireland this year. St. Patrick’s Day is about more than just green beer. The holiday commemorates Ireland’s patron saint and most famous religious symbol– Saint Patrick, a fifth-century priest whose missionary and evangelical work brought Christianity to Ireland. The holiday, celebrated on the traditionally recognized date of his death (in 461 A.D.), is a commemoration not only of Irish culture but of his life’s work and achievements. 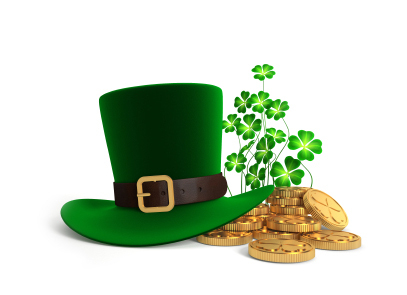 Evidence exists of the Irish celebrating a holiday in Saint Patrick’s honor as early as the ninth century, though the Catholic Church did not add the holiday to the liturgical calendar until the early 1600s. The shamrock is the traditional symbol of St. Patrick’s Day; as legend has it, Saint Patrick used the leaf to explain the concept of the Holy Trinity to the Irish Pagans. Even the drinking associated with the holiday has religious roots: St. Patrick’s Day almost always falls during the Catholic Lenten season, and the Church traditionally lifts the Lenten restrictions on diet and alcohol consumption for the holiday. Ireland only launched the St. Patrick’s Festival in the mid-1990s, as a way to showcase Ireland and its history and culture. However, in less than twenty years, the festival has grown to a five-day event expected to attract over million visitors total in 2015. AffordableTours.com primarily offers Irish vacations through two companies, Brendan Vacations and CIE Tours. These two travel providers have many years of experience providing personalized, high-quality tours that not only offer a specialized, personal touch, but also have a team of experts on hand to guide your tours and take care of your needs. This, of course, is just a small sample of the sights and settings available to you when you visit Ireland. If the holiday has you in an Irish state of mind, AffordableTours.com is offering specials on vacations to Ireland through CIE Tours and Brendan Vacations. To book your vacation today, visit our website or call 1-800-935-2620 and one of our professionals will assist you.